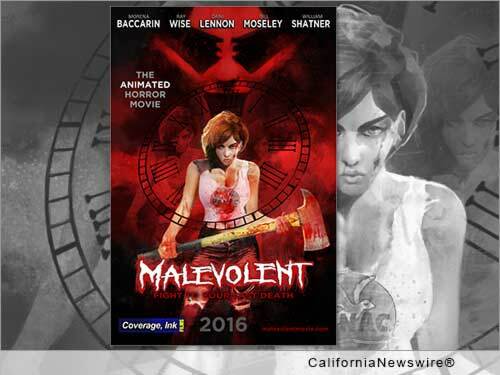 LOS ANGELES, Calif. /California Newswire/ — Coverage Ink Films, producers of the animated horror thriller "Malevolent" have launched an IndieGogo campaign. The goal is to reach $45K for finishing funds. The film stars Ray Wise ("Twin Peaks," "Robocop"), Morena Baccarin ("Deadpool," "Gotham," "Firefly"), Bill "Choptop" Moseley ("The Devil's Rejects," "Texas Chainsaw Massacre II") and sci-fi legend William Shatner ("Star Trek," "Boston Legal"). "Malevolent" combines horror and sci-fi into an original, time-twisting concoction. The producers describe the movie as "SAW meets Groundhog Day." The entirely hand-drawn, 2-D movie is being designed by renowned fantasy artist Carl Frank ("Dungeons & Dragons, Magic: the Gathering"). It is one of, if not the first, U.S.-produced animated horror feature films. In "Malevolent," a young woman (Dani Lennon, FearNet/Machinima's "BITE ME") and her siblings are summoned by their dying industrialist father (Wise) ostensibly to discuss his will. But what he has in mind is far more sinister — if he's going down, he's taking everyone else out with him. The wrinkle — a race of inter-dimensional gamblers, led by Baccarin's Gamemaster, wager on the outcome — and they have the ability to manipulate time to change the playing field as they see fit. Shatner's "Overseer" calls the match. "Malevolent" is a bloody genre-bender. "We're honored and excited to be working with such talented stars whose performances we've followed for years," says executive producer and co-creator Tanya Klein. "We're really looking forward to delivering a unique visual horror experience for fans of action, horror, graphic novels and cinephiles of all types. 'Malevolent' is our sick and twisted little baby; we want to nurture it and give it the best — and then unleash it into the world to create havoc." The unique plot and style drew the attention of iconic sci-fi/horror stars. "I'm the big cheese in this one," says Wise, whose recent credits include "Agent Carter" and "How I Met Your Mother." "I play the dying billionaire industrialist who has a family that he's, well, not too fond of (laughs)." "What drew me to this project was how dark it was — this idea that we could be finger puppets, that somebody could be up there wreaking chaos on our lives," says Baccarin, currently starring in #1 movie in the U.S. – "Deadpool." "I'm really looking forward to 'Malevolent,'" adds Wise. "I think it's going to be groundbreaking." "Our goal is to make these amazing, elevated movies for everyone," says executive producer and co-creator Jim Cirile, "with a serious undercurrent of geek. And we're so stoked to be working with such an amazing cast and team. That said, making something this ambitious has tapped out our internal financing. So now it's time to rally the troops to help get us over the finish line. And in return, we've got something pretty awesome for everyone." The "Malevolent" 30-day IndieGogo campaign seeks $45K, which will allow Coverage Ink Films to hire the animation resources, sound designer and composer necessary to deliver the film in 2016. The film employs a team of 25 artists, colorists and animators around the world. "Malevolent" is directed by Jason Axinn ("Starpocalypse") and produced by Cindi Rice ("Xombie," "Dragons of Autumn Twilight," "Knights of Bloodsteel") and Paige Barnett ("Bite Me," "The Continuum," "Interns"). "Malevolent" is anticipated for completion late 2016. Production company Coverage Ink Films is an offshoot of Coverage Ink, a leading independent screenplay/analysis development service founded in 2002. "We're all about indie empowerment," says Cirile. "You can make great movies without a lot of money. You just have to take the time to get the script right. That's what Coverage Ink is all about. And in this case, we need a little help from our friends. But the results will definitely be worth it. "